Just in stock at Evolv is Your Beauty Tonic – a new daily supplement to help battle the signs of ageing. It means you can have all this with just a single daily dose in water, juice, or your favourite smoothie! 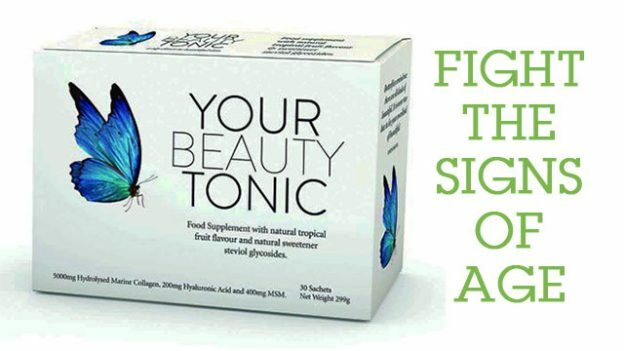 Your Beauty Tonic is a unique and natural food supplement with a tasty tropical fruit flavour. It takes you a sip closer to beautiful skin, hair and nails. A number of things can have negative effects on the health of your skin, hair and nails. These include dehydration, ageing, sun damage, pollution and so much more. This product has been specifically formulated to rejuvenate and protect you from the inside out, to therefore protect you from these factors. Your Beauty Tonic contains an impressive range of essential ingredients in their most available forms. These help improve your skins suppleness, reduce wrinkles, increase moisture levels and improve skin smoothness. Just one sachet of this delicious drink contains 5000mg of Hydrolysed Marine Collagen, 200mg of Hyaluronic Acid, 300mg of MSM and many more skin, hair and nail essential nutrients. Your Beauty Tonic contains no artificial flavours, colours, sugars, preservatives or GMOs. Simply empty the contents of a sachet into a glass and add 250 to 350 mls of water to the powder. Stir to dissolve, and drink. It can also be added to your favourite juice or smoothie. It is best taken in the morning. It is recommended to use it for at least three months, for best results. Hydrolysed Marine Collagen – 5000mg, Methyl Sulfonyl Methane(MSM) – 400mg, Hylauronic Acid – 200mg, Nettle Leaf Extract 10:1 – 100mg, Gotu Kola Leaf – 25mg, Vitamin A – 800mcg, Vitamin C – 80mg, Vitamin B2 – (Riboflavin)- 1.4mg, Vitamin B3 (Niacin)- 16mg, Vitamin B6 – 1.4mg, Vitamin B12 – 2.5 mcg, Vitamin B7 (Biotin) – 50mcg, Magnesium – 200mg, Zinc – 5mg, Copper – .5mg, Selenium – 27.5mcg. Hydrolysed Marine Collagen, Methyl Sulfonyl Methane, Hylauronic Acid, Nettle Leaf Extract 10:1, Gotu Kola Leaf, Vitamin A, Vitamin C, Vitamin B2 – (Riboflavin), Vitamin B3 (Niacin), Vitamin B6, Vitamin B12, Vitamin B7 (Biotin), Magnesium, Zinc, Copper, Selenium. Your Beauty Tonic is now in stock at Evolv – just call in to try it or find out more. The RRP is €59.95 for one month’s supply, but we sometimes have special offers on Fab Friday/Super Saturday weekends. Keep an eye on our blog for details!